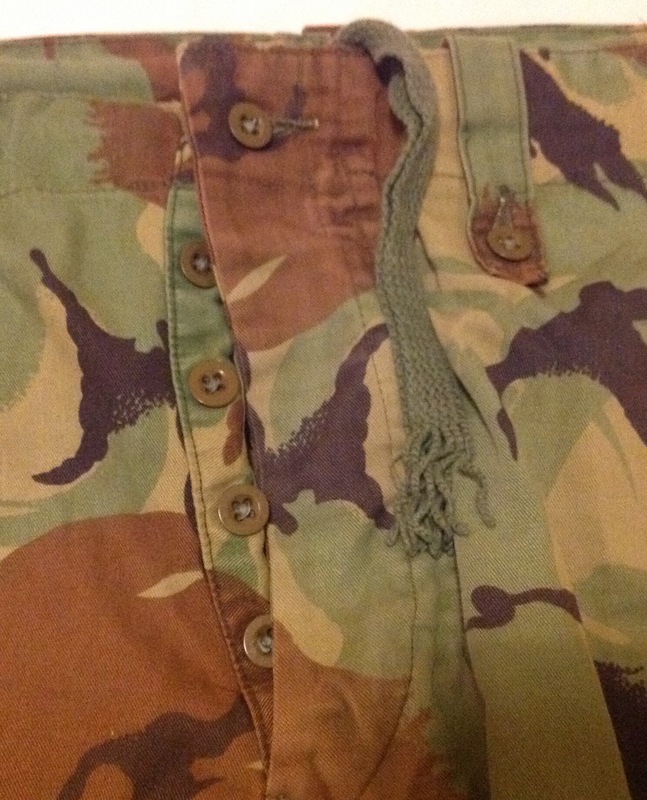 Earlier this year we looked at the 1970s jungle DPM shirt here. 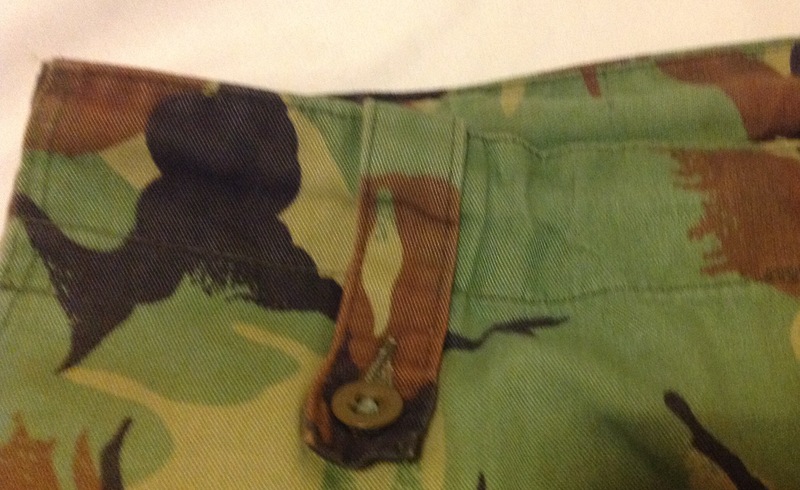 Tonight it is the turn of the matching trousers to be considered. 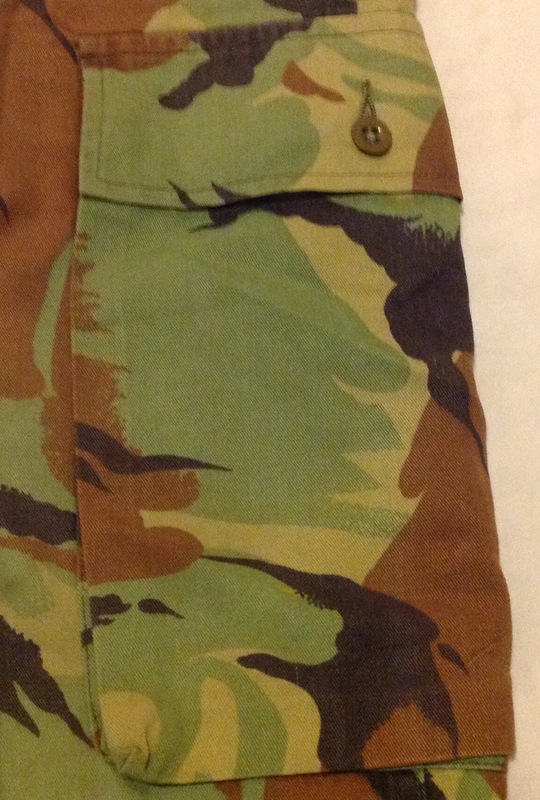 The trousers are made from the same lightweight DPM fabric as the shirt: DPM, or disruptive pattern material, had been designed in the 1960s, very much inspired by the patterns used on Denison smocks in World War Two. The pattern uses four basic colours, typically seen in western Europe- black, dark brown, mid brown and dark sand. These colours were modified slightly for tropical uniforms with more vibrant hues used that rapidly faded to pastel shades. 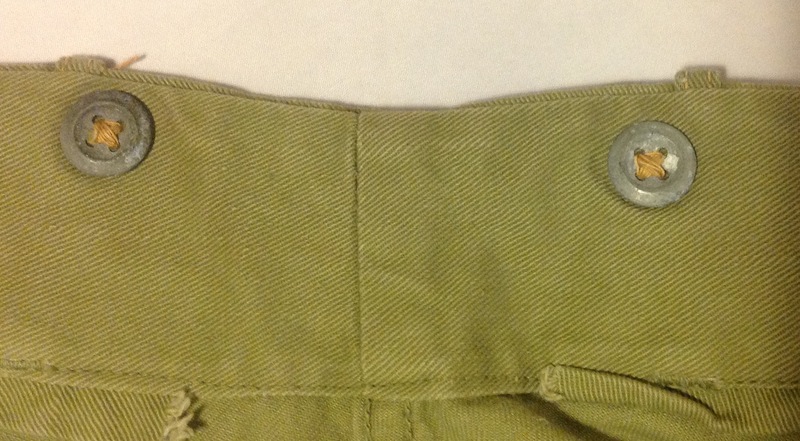 These trousers have large buttoned pockets on each thigh: A further pocket is provided on the seat: Buttoned belt loops are provided to help support the trousers: As is a drawstring through the waist that can help adjust the size: Note also the button fly using a row of small green buttons. 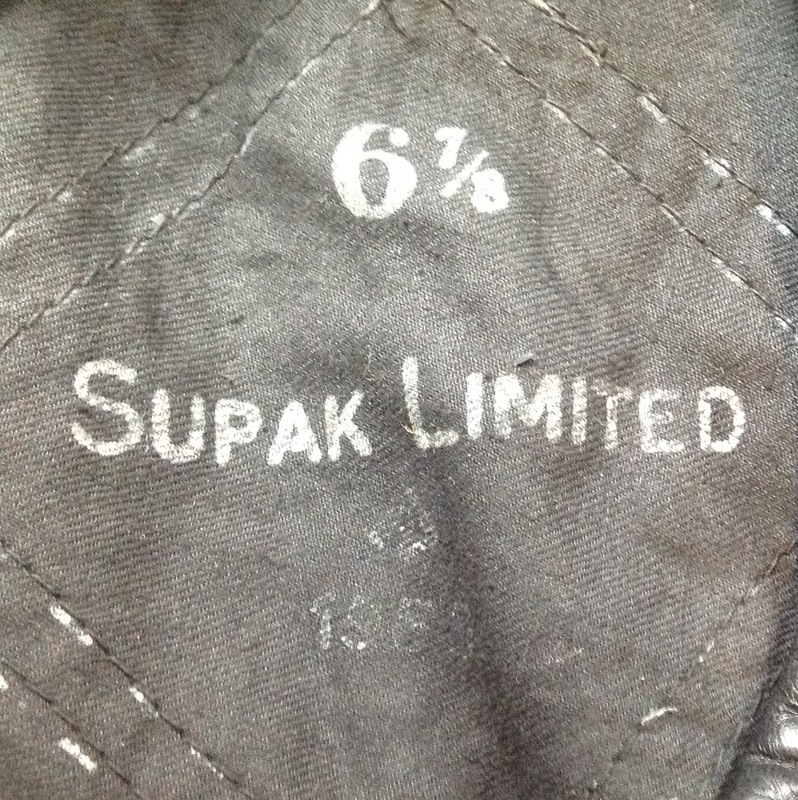 The bottom of each trouser leg has holes to pass drawstrings through, allowing the bottoms to be tied off and bloused over boots if required: The label for the trousers is on the inside of the waist belt, sadly in this case the label has been washed clean, and a hand inked size of ‘8’ has been written on in its place: A size 8 pair of trousers equates to a waist of 32-33 inches and a seat of 38-39 inches: These trousers were used throughout the 1970s and 1980s until the introduction of the CS95 clothing in the late 1990s. 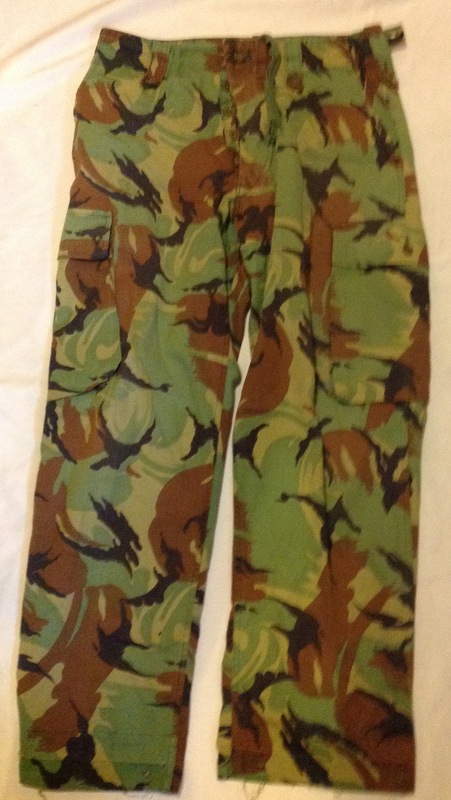 These uniforms were worn extensively during jungle training in Brunei at the Jungle Warfare School there. The country is still used today for training, with a large British Army presence. The British Army in Brunei comprises an Infantry Battalion and a Bell 212 Helicopter Flight of the Army Air Corps. The climate of Brunei is well suited to jungle operations and the Training Team Brunei run jungle warfare courses for all members of the British Army ranging from Jungle Warfare Instructor Courses to long range patrolling and tracking. The Infantry Battalion is supported by the small British Garrison, which provides all logistic and administrative support. 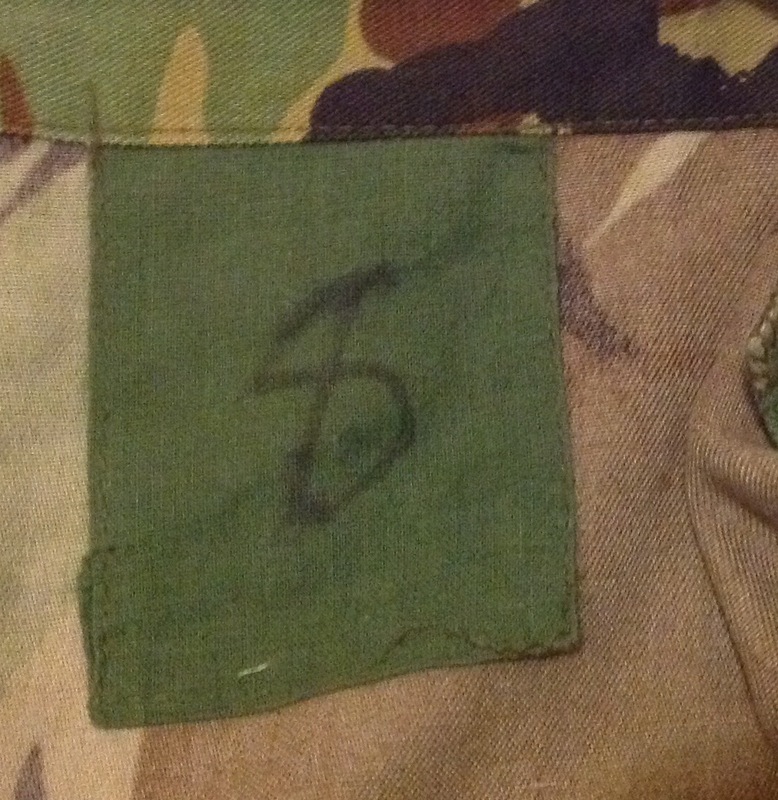 This entry was posted in British Army, Camouflage, Jungle, Post WW2, Uniform on February 29, 2016 by hatchfive. 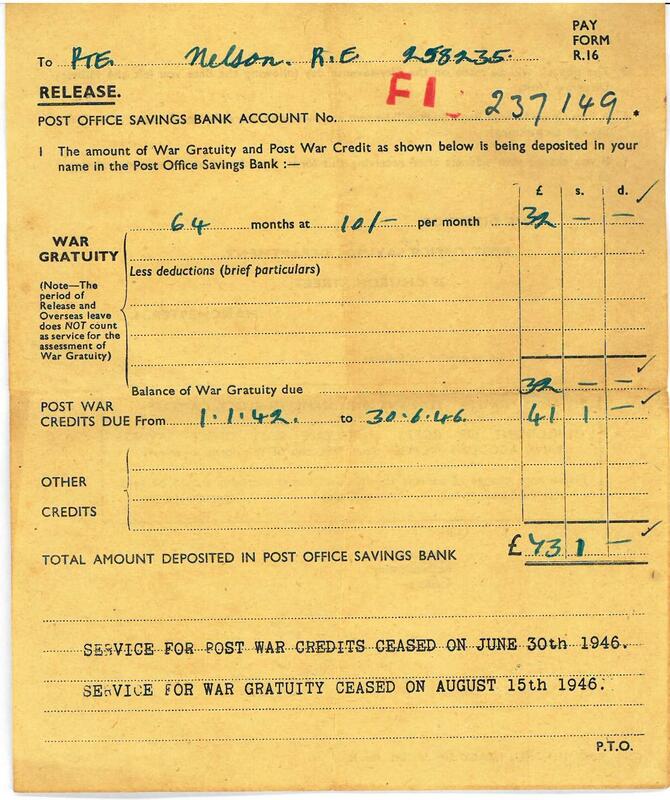 War Gratuity on the scale set out below will be granted to officers and men who have had at least six months’ approved war service and who are released or honourably discharged from the forces. The gratuity will be assessed on the total period or periods of war service in the forces, on full service pay, from September 3, 1939, up to the date of release form a dispersal centre (or from a unit, &c., for those who do not pass through dispersal centres. Periods of unmobilised service in the reserves and other periods without service pay, and service which has been forfeited and not restored, will not count. 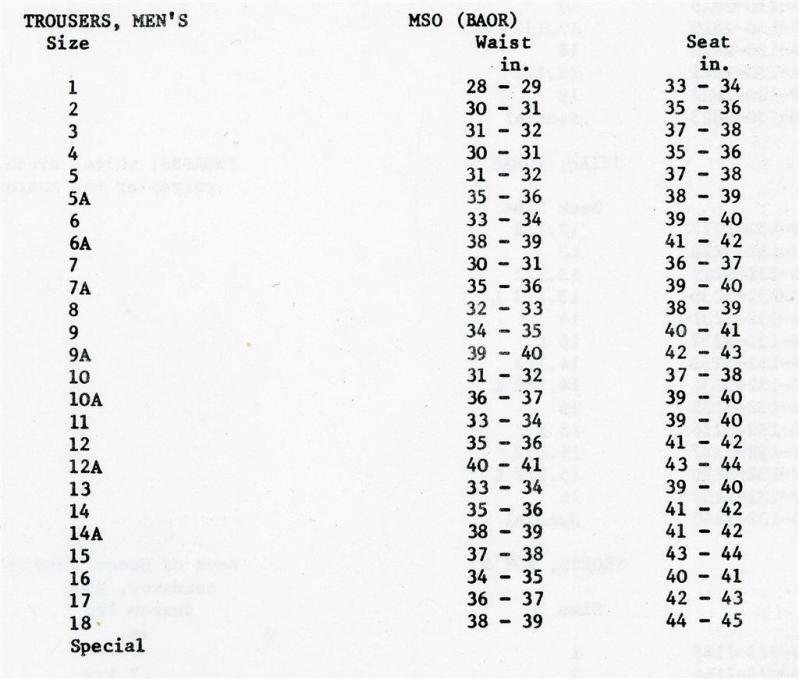 The basic rate of gratuity for ratings and other ranks will be 10s., and for the lowest rank of officer 25s., for each complete month of service as above. Officers and men who have held paid rank above the lowest will qualify for higher rates of gratuity, based upon the substantive or war substantive rank held at the day of release, or, if more favourable, upon the highest paid rank held during the war for a period or periods amounting to not less than six months in all. Where service has been given both in the ranks and as an officer, the gratuity will be calculated separately for each period of service. 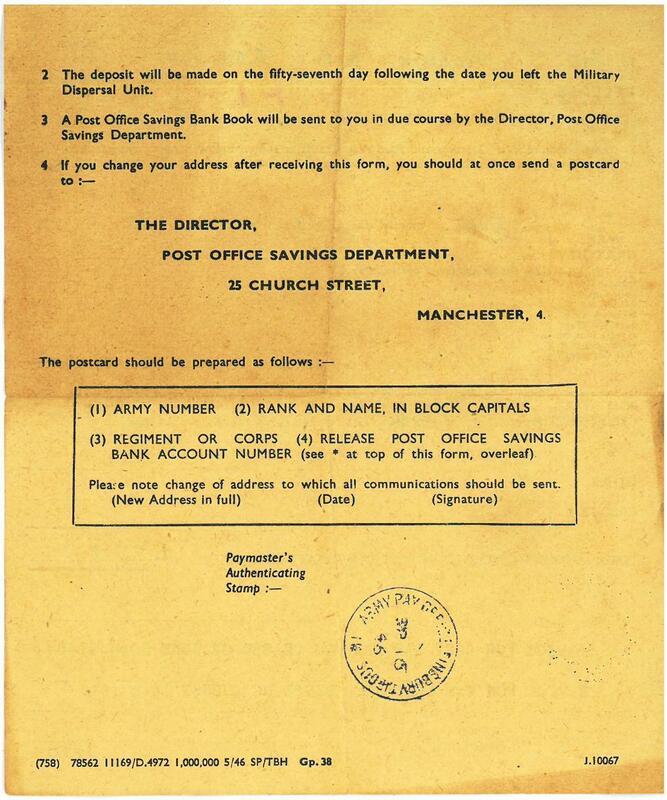 Sixpence a day is to be set aside as a post-war credit and the sum due under this arrangement will be paid over when the person concerned leaves the service without prejudice to any war gratuity which may be granted when hostilities end. 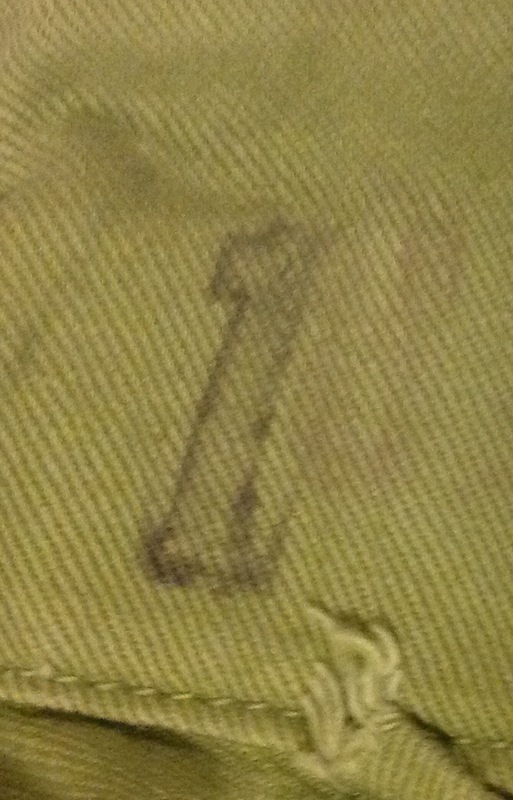 Then followed lots of form filling, a medical (still A1! ), a kit inspection and I was bundled off back to Catterick Camp, arriving a few days before Christmas and prepared to go AWOL if my demob. was not cleared in time for Christmas at home. It was – just, and after collecting my demob. outfit from a depot in York I left the Army with 4 weeks’ leave pay and a demob. gratuity of around £100, which I shortly blew on an Army surplus Royal Enfield 350cc DR’s motorbike and a well-tailored bespoke suit. The spending habits of this man are typical, many were to regret later in life not buying a house with the sum of money as many could easily have afforded one, but as my Grandfather told us ‘men like us didn’t own houses in those days’ so it never crossed his mind. This entry was posted in Documents, WW2 on February 28, 2016 by hatchfive. 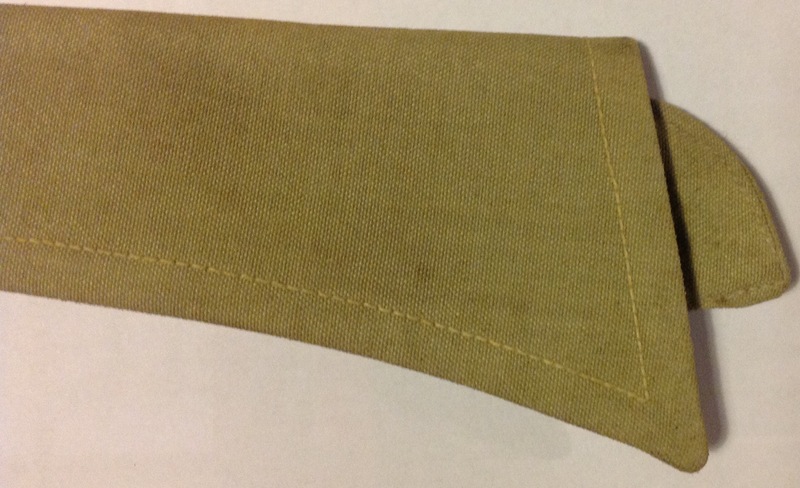 In 1933 the Canadian Army introduced a new summer uniform of khaki drill in a distinctive pale green colour. 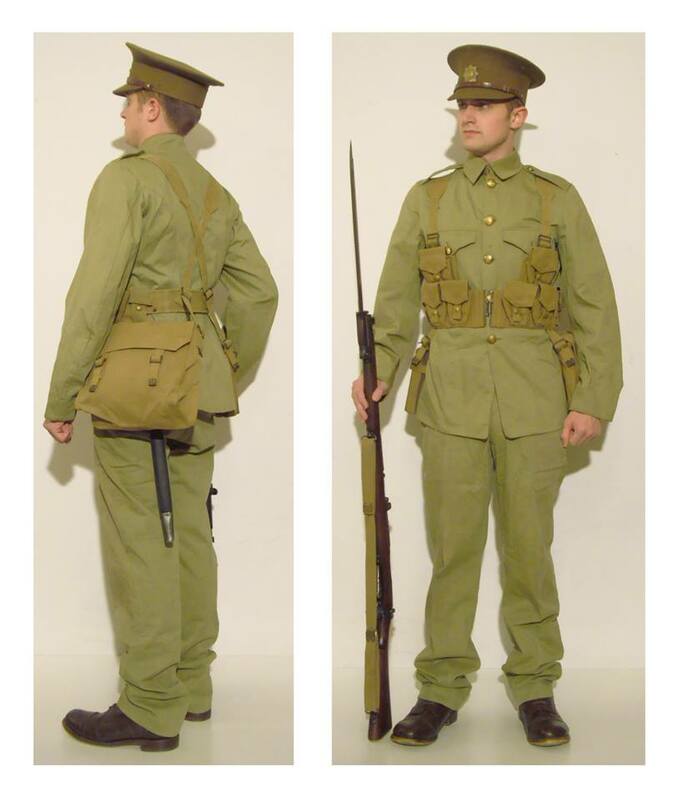 To save money this uniform was only issued to permanent troops and not reservists and had a relatively short life span, being largely dropped on the outbreak of the Second World War. 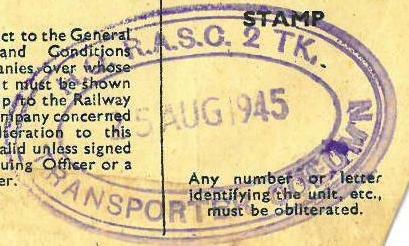 As late as 1938 the Department of National Defence refused to issue the uniform to non-permanent force members on the grounds of cost. 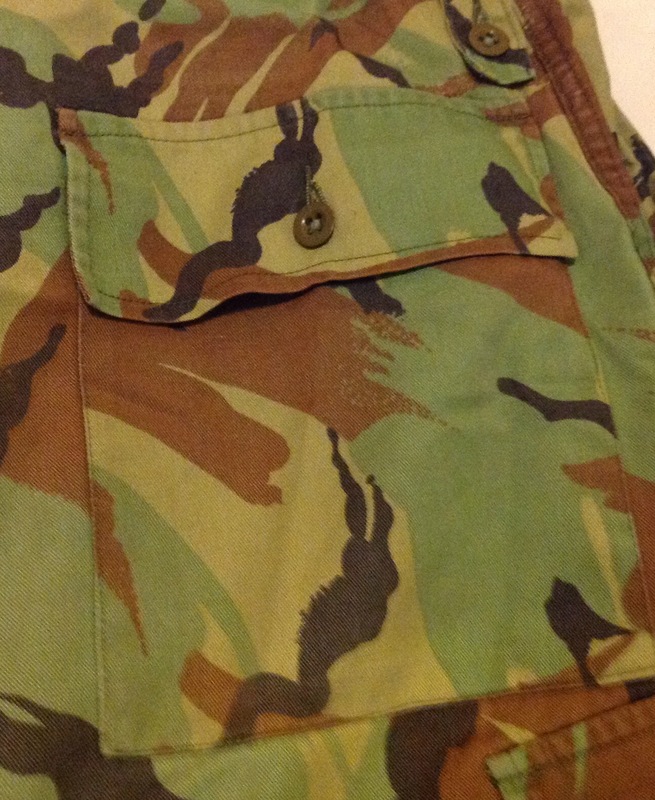 As can be expected from such a short service life, this makes the uniform a little rarer than most so I was very pleased to be able to purchase a pair of trousers from it this week. Sadly they are in a size 1 which means they are far too small for me, but they will do in my collection until I come across a large pair. 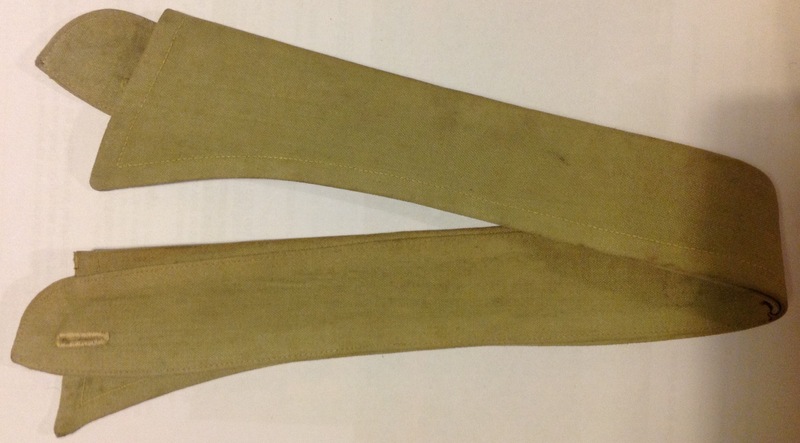 The trousers themselves are made of a thick cotton drill in that distinctive shade: The fly is fastened with pressed metal buttons: The same buttons are used on the inside of the waistband to attach braces: The soldier also has the option of wearing a belt as loops are provided: These would have been used with a Canadian Army issue brown leather belt. 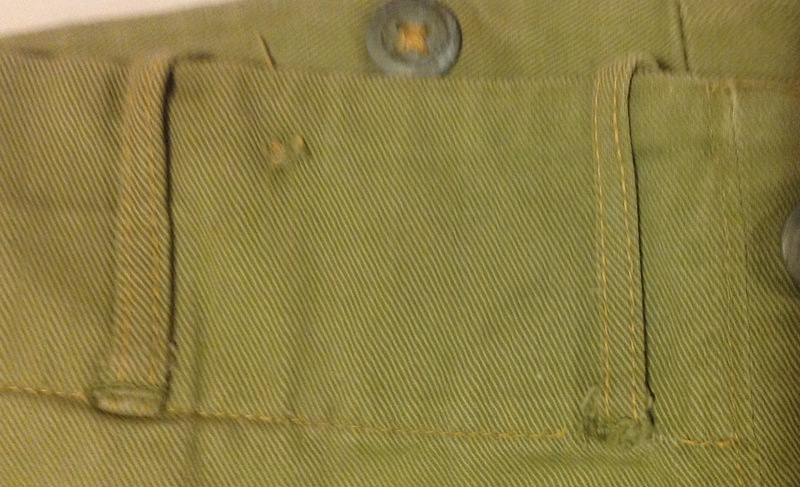 The trousers have simple internal pockets on each hip, with a ‘slash’ opening on the seam: The size, ‘1’, is stamped onto the waistband: The trousers are clearly marked with a /|\ inside a ‘C’ indicating their Canadian origin: And a couple of stamps for the Royal Canadian Ordnance Corps, as the ‘Royal’ designation was only adopted in 1936 these trousers must have been issued after that date: These stamps also indicate that these trousers were issued in Aurora, Ontario. Sadly a combination of these trousers being too small and a lack of a suitable jacket prevent me from presenting my own reconstruction of this uniform; I am therefore grateful to Michael Skriletz for permission to use his excellent reconstruction of a private from the Royal Canadian Regiment in 1939: For more fantastic British and Empire uniform reconstructions please look at the ‘British Empire Uniforms 1939-1943’ page on Facebook. This entry was posted in Canada, Inter-War, Uniform on February 27, 2016 by hatchfive. 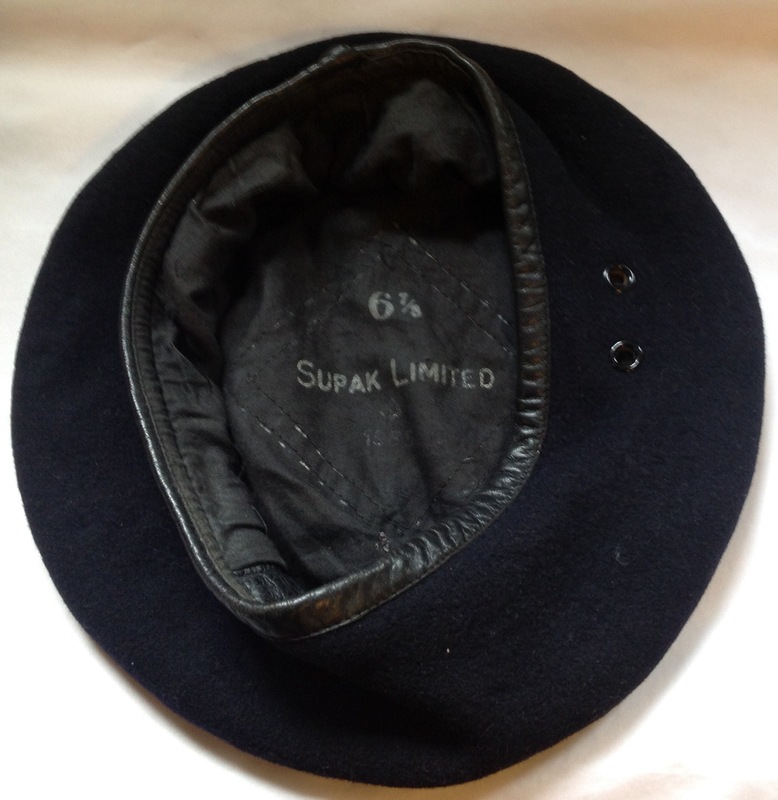 On each shorn head was a seemingly huge navy blue beret; whilst in time we would learn how to shrink and shape this headgear, for some weeks these monstrosities would look like oversize cowpats. We all got berets. They were black shapeless things when issued. But the beret also quickly established its own particular personality. It too has to be broken in. When newly issued, the Army beret is fluffy and pansy. It perches on top of the head with its weight equally on either side. It announces ‘new recruit’ as clearly as the army number. 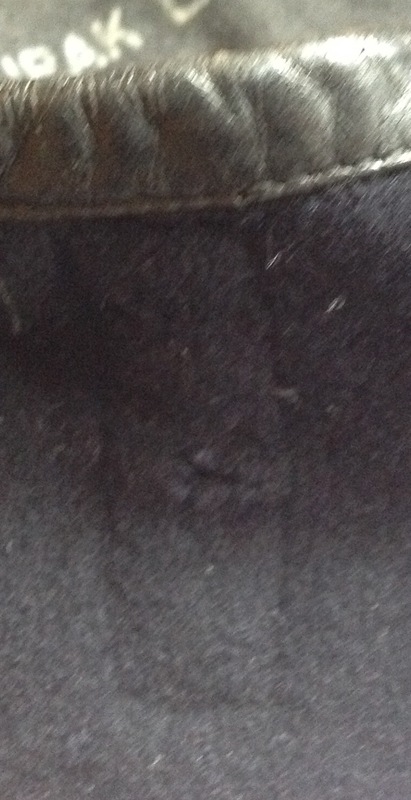 When properly broken in, the beret denotes ‘manhood’ more than any other single piece of equipment. The shiny headband shoots horizontally across the forehead exactly one and a half inches above the eye. The main body of the beret is moulded to the shape of the soldier’s head. 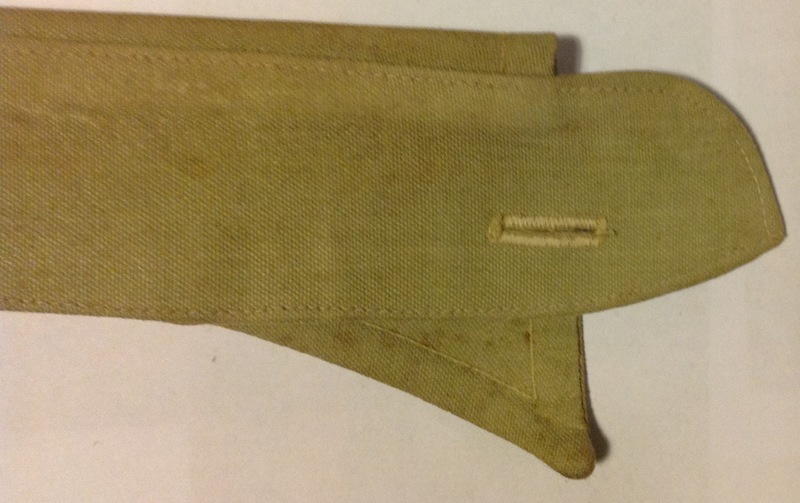 It is no surprise to anyone who has ever worn a beret in anger that the heroism of whole regiments is described by reference to this little garment. 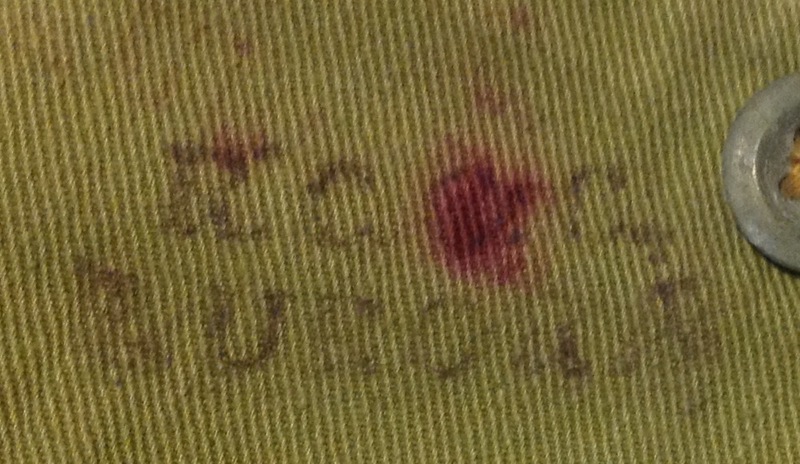 When Paras are referred to as ‘Red Berets’ there is legendary symbolism in the name. 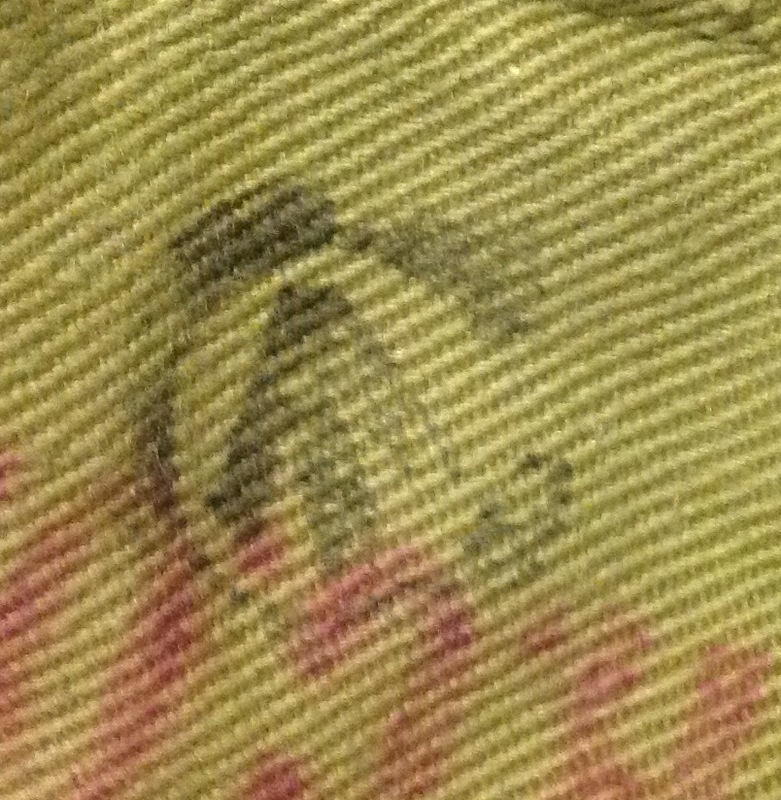 It takes an average of fifteen hours of steaming, ironing and cursing to get the shape of a beret right. Then, at last, with a bit of luck, the little black bugger will begin to look manly, sloping gently rightwards away from a gleaming cap badge. No-one can perform heroics with a thing on their head that looks like a cow-pat. The use of the midnight blue beret has gradually declined over the years as more and more regiments gained permission for their own distinctive headgear, however it is still in widespread use in some regiments and with the Royal Navy and Royal Marines who have not completed commando training; modern berets however normally have a plastic inner to the crown and are of a slightly different shape to this one. 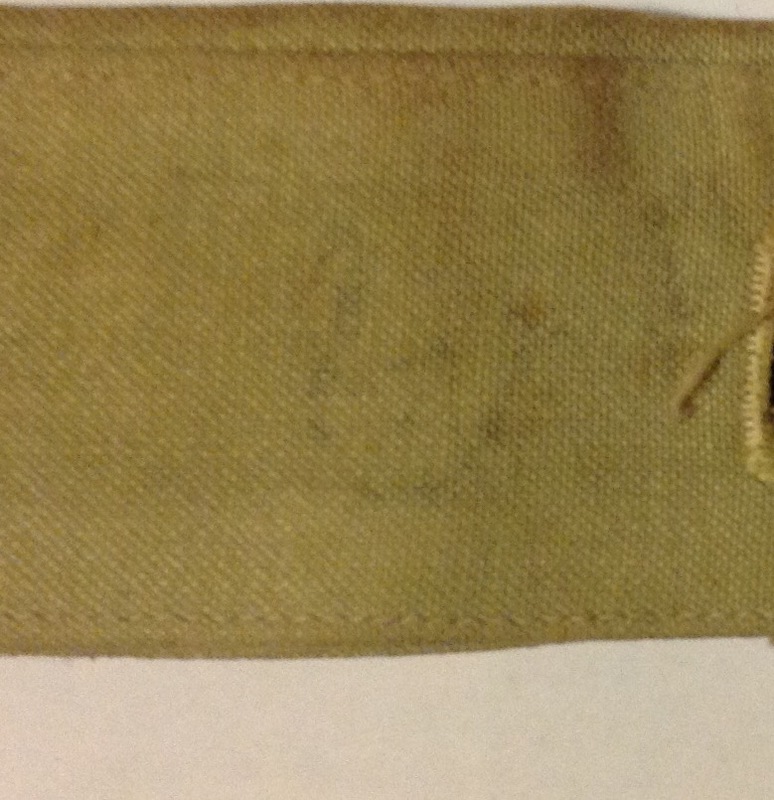 This entry was posted in British Army, Headress, Post WW2 on February 26, 2016 by hatchfive. Collars.- The pattern is left to the discretion of commanding officers but all officers of a unit must be dressed alike. 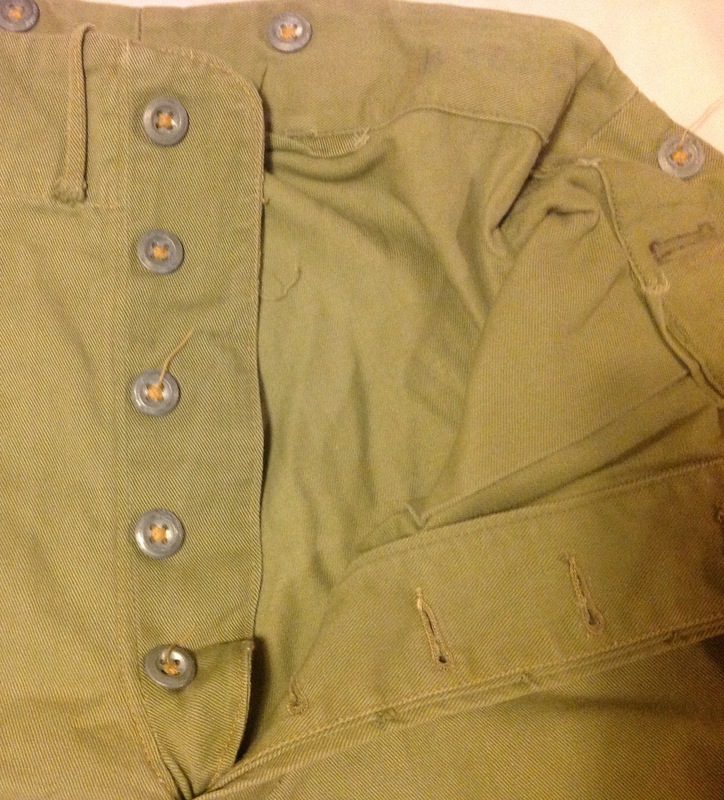 Drab flannel or khaki collars will be worn with service dress and khaki drill jackets at all times. 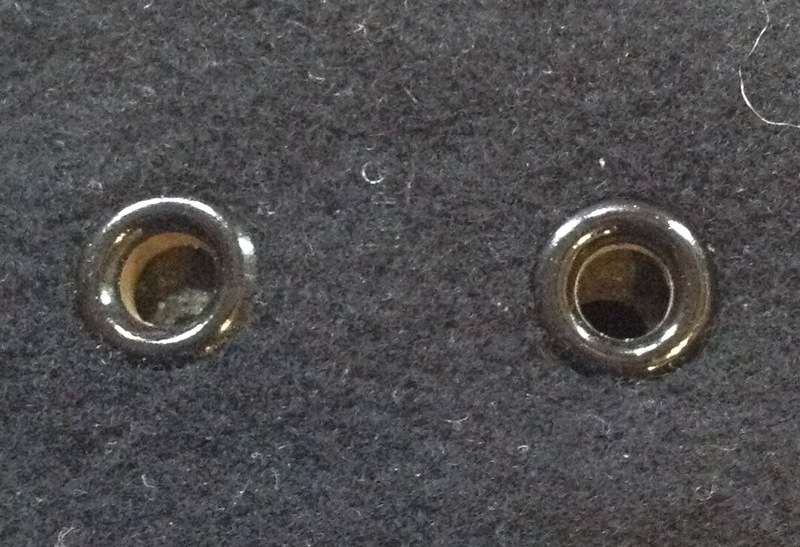 A plain gold safety pin may be worn under the tie to keep the soft collar in place. 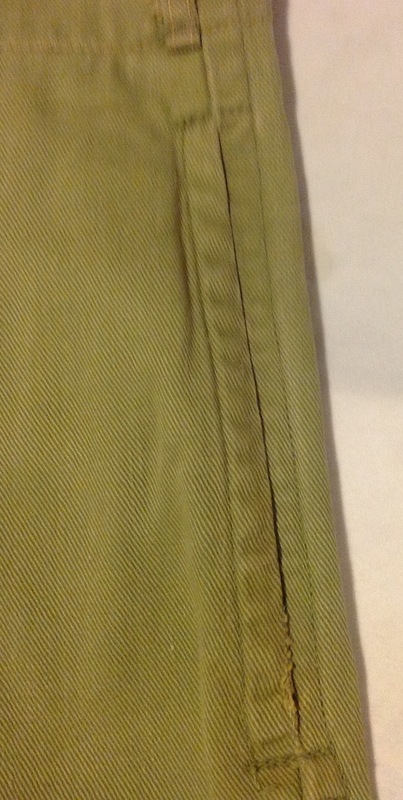 The collar of the shirt may be worn open without a tie. 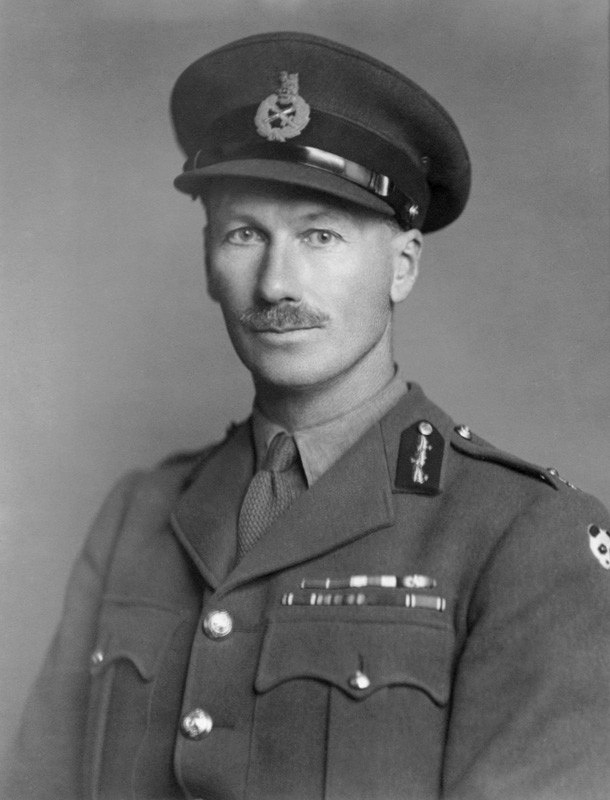 This collar is faintly marked with the /|\ inside a ‘U’ acceptance mark of the South African Army: In this fine portrait of Lieutenant General John Darcy shows off the officer’s collar nicely, worn with the regulation shirt, tie and service dress jacket: An officer would normally have at least half a dozen of these collars and they would be carried in his baggage, however by the Second World War they were very much worn away from the front lines, soldiers battledress being a far more sensible option in battle. This entry was posted in British Army, South Africa, Uniform, WW2 on February 25, 2016 by hatchfive. That is when I took the opportunity to remind the officer in charge that I was off to be married in the morning, and had been granted leave to go a day early. “Good luck” he said, “you’ll have to find your own way back, you’ll find your leave pass and ticket in the company office”. So there I was again, on my own, doing a mad dash. 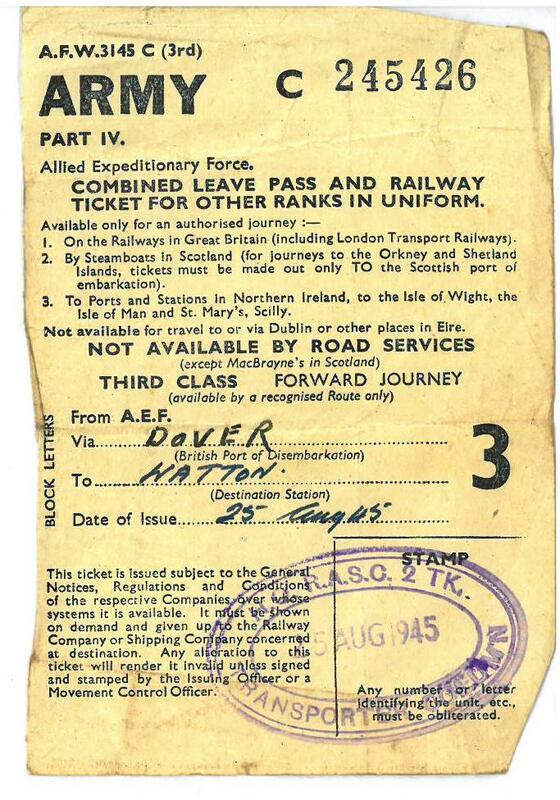 Tickets, best uniform out of a kitbag, local station to Exeter. Now, there are two mainline stations, and as I’d never been this way before, I picked the nearest, St. David’s. Big mistake! Not a direct line; change at Bristol, and having got there, found that there was no train due for another two hours. And that was stopping at all stations. Well, I was stationed in Egypt, and there for two years, and we didn’t get any leave, you see. So; after a…nearly two years they decided to give us a leave, a month’s leave to come home from Egypt. So I got me pass, and eventually, I got to Piccadilly Station in Manchester. I got the all night bus to where I lived in Sale. And I’m walking at 3 o’clock in the morning as I got off the bus; and I’m walking up the road with my kitbag and all me kit, and a policeman jumps out of a doorway, and asks me where I was going. I said, “I’m going home on leave.” He said, “Where’ve you come from?” I said, “Egypt. “But he didn’t believe me, you see. He said, “Trying to kid me, they don’t send you on leave from Egypt” I said, “Well here’s proof.” So I give him my pass, my leave pass. “I’m sorry, son!” he said, “How far have you got to go?” I said, “Well I’ve got a mile or so to walk to my mother’s. “Put your kitbag on my handlebars”, he said, “Son, and I’ll help you home with it.” And he walks all the way home with me, with me kitbag on the handlebars. This entry was posted in British Army, Documents, WW2 on February 24, 2016 by hatchfive. My thanks go to Andrew Dearlove for helping me with tonight’s bayonet; which is possibly my favourite bladed weapon in the collection: The No7 bayonet. The No7 was designed in 1944 for use with both the No4 rifle and the Sten MkV. 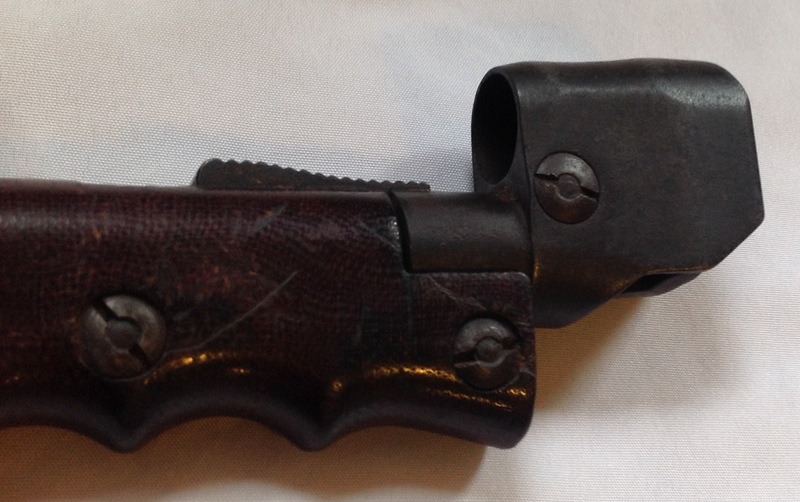 Up until this point the No4 had been issued with a spike bayonet, which no one liked, and a way was sought to combine the socket attachment used to attach the bayonet to the No4 with the bowie style blade used on the jungle carbine bayonet, which was universally liked. 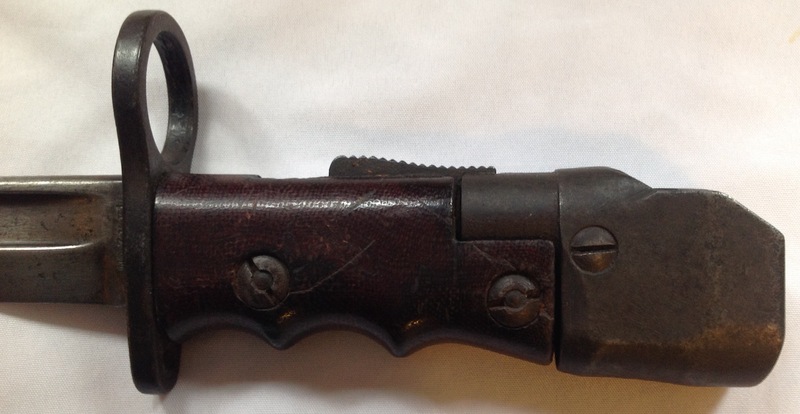 The resulting bayonet was a complicated, but very elegant blade: The pommel of the handle was designed to swivel through 180 degrees to allow the bayonet to be affixed to a weapon or used as a fighting knife, a sprung bar holds the swivelling portion firmly in place: Pulling it back and twisting the base reveals the socket connector: Which then attaches to the No4 rifle in a conventional style: A large muzzle ring is designed to allow rounds to pass safely through: These were made to the same design as that on the Jungle Carbine, not to fit that weapon, but because the part was available and it ensured that even with worn out barrels and poor ammunition, the round would clear the bayonet. 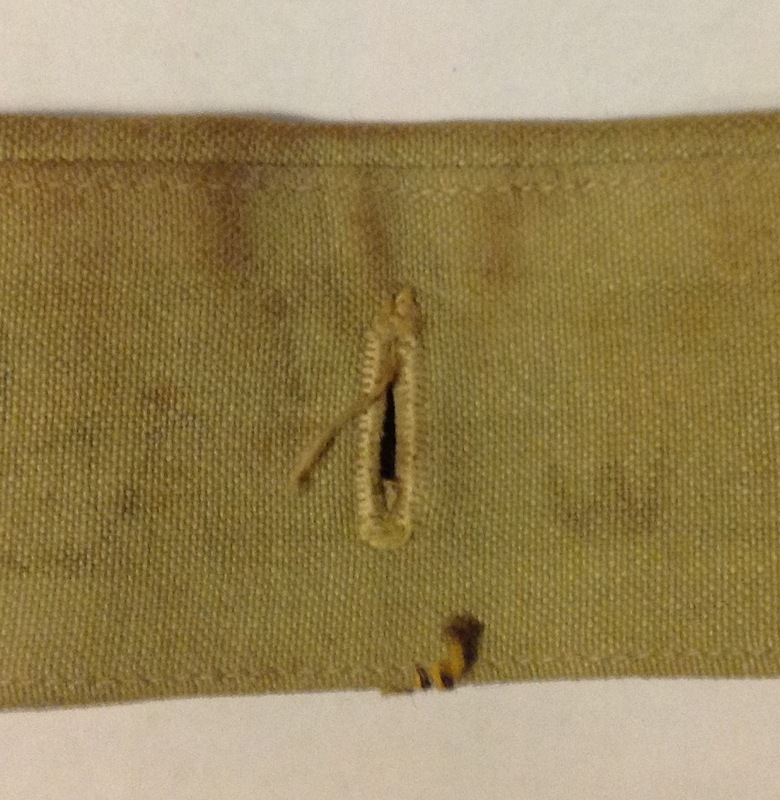 This was to prove the bayonets’ downfall as it was discovered if the socket was not fully engaged, the bayonet would still fit to the rifle, but the .303 round could still hit the muzzle ring on firing. 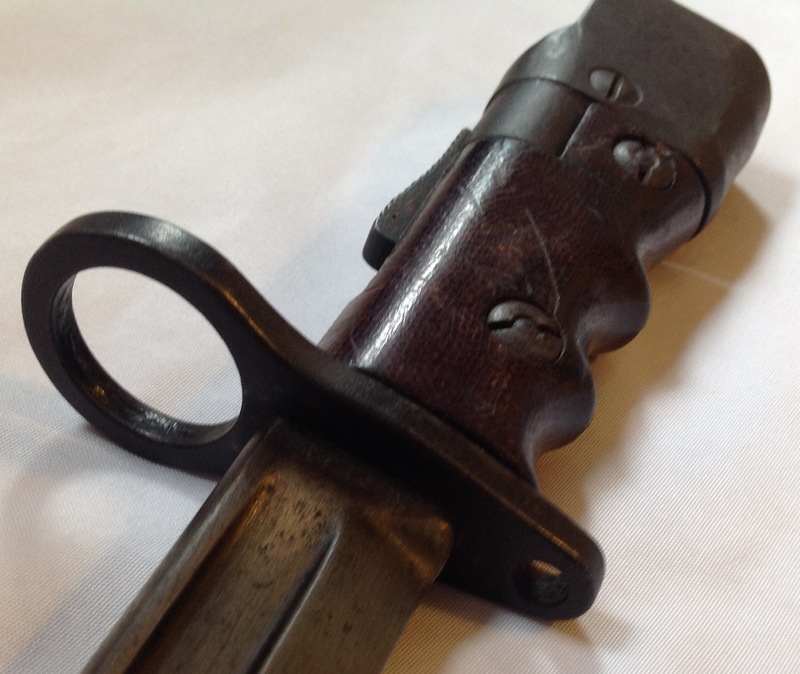 Once this was discovered the bayonet was rapidly issued only for use with the MkV Sten and for ceremonial duties by the Guards in London where it was visually far better suited than a spike bayonet. Birmingham Small Arms Ltd. – 25,000; Elkington & Co. Ltd. Birmingham – 20,000; Royal Ordinance Factory, Poole – 30,000; Royal Ordinance Factory, Newport – 100,000. 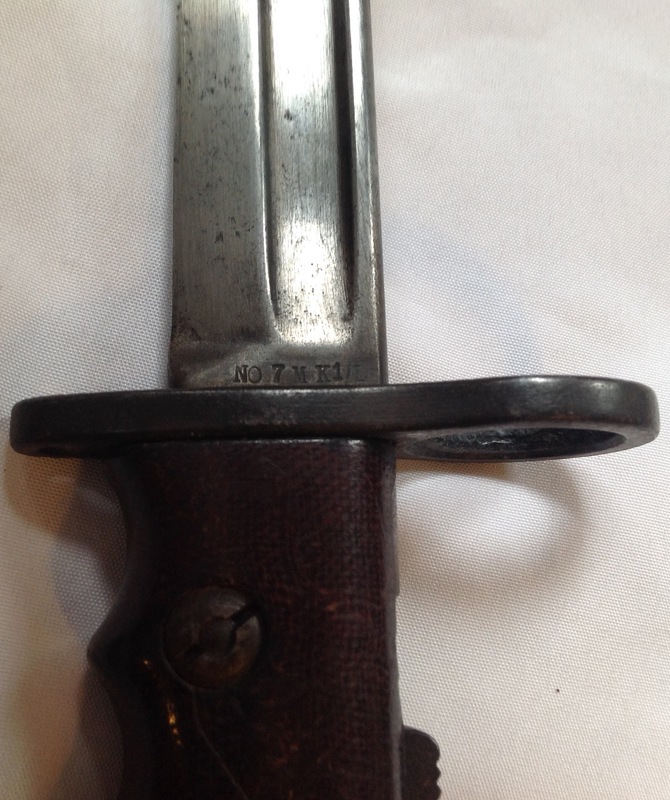 As can be imagined with relatively low numbers, this is a comparatively rare bayonet when compared with the wartime spike bayonet. The bayonet was issued with the standard scabbard also used on the No5 and No9 bayonets: Despite being a flawed design, I really like this bayonet for the engineering involved and the general aesthetics which make it a particularly nice blade and a welcome addition to my collection. This entry was posted in British Army, Post WW2, Weapons on February 23, 2016 by hatchfive.